TWO years after it was re-opened, the Borders Railway shows no sign of losing momentum as it continues to capture the world’s attention. VisitScotland’s international marketing campaign to promote the Borders Railway has reached almost 35 million people in the last two years, helping to inspire visitors to explore Edinburgh, Midlothian and the Scottish Borders. Over 2.6million people have travelled on the Borders Railway since it re-opened two years ago. In August 2017, a unique experience offering passengers, for the first time, the opportunity to board a steam train in West Lothian and Fife to cross the Forth Bridge and onwards to the new Borders Railway proved a phenomenal success with 1680 passengers taking the journey over just four days. The 31-mile Borders Railway route stretching from Edinburgh Waverley to Tweedbank was officially opened by HM The Queen on 9 September 2015. The second anniversary coincides with the opening of Queensferry Crossing. As with Borders Railway, the bridge has been a catalyst for employment and other economic opportunities and is expected to lead to a stream of businesses looking to acquire land and property in the surrounding areas. It will also help advance tourism opportunities. Both projects are seen as key additions to Scotland’s transport infrastructure, helping to safeguard and strengthen Scotland’s economic prosperity. More than 261,000 views of three Facebook Live videos of the first steam train experience on 6th August 2017 generating 1395 comments across the three posts. Over 2.6million passengers have travelled on the Borders railway line since it re-opened in September 2015, with more than 65% of visitors that used the line stating that the railway line was a factor in their decision to make their trip. 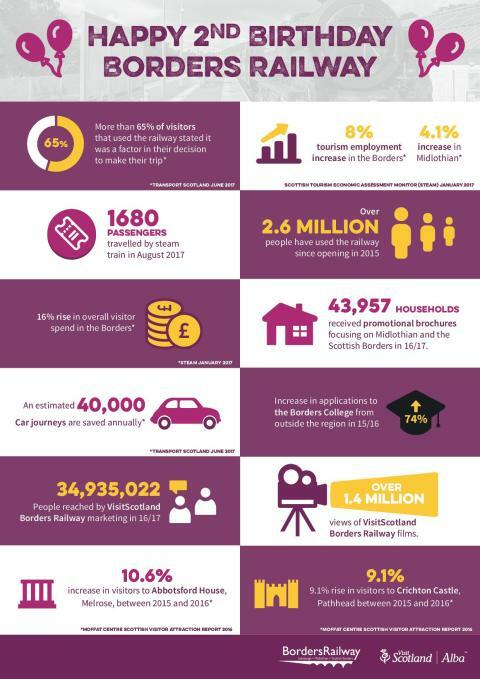 Almost 35 million potential visitors reached as a result of marketing of the Borders Railway by VisitScotland in 2016-2017. An 8% rise in tourism employment in the Scottish Borders, and a 4.1% increase in Midlothian. 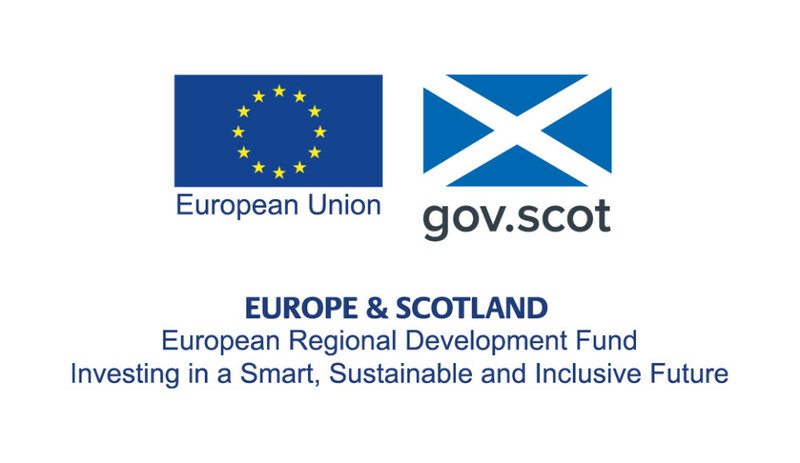 As part of the Borders Railway Blueprint partnership, VisitScotland seeks to maximize benefits from the new Borders Railway. £367,000 was invested in a unique three-year (2015-2017) national and international marketing campaign to put the new Railway on the map. The funding was provided by Scottish Borders Council and Midlothian Council, with match funding from the Scottish Government. VisitScotland will continue to work with partners to promote the Borders Railway to national and international markets with digital marketing activity in Canada and Germany planned in the next year. “The Borders Railway has had a massive impact on the local economy and has encouraged people to come and visit this part of the country from all over the world. From the momentous re-opening of the historic route by HM The Queen to this summer’s unique steam train opportunity, the Borders Railway has well and truly captured the attention of the world’s media. “We want to ensure that the spotlight continues to shine on the regions surrounding the Borders Railway and the next phase of our international marketing campaign will focus on inspiring overseas visitors from Canada and Germany to make the trip. “The Borders Railway has been an extraordinary success. Each and every day thousands of people are travelling to and from the region for work, to study and to catch up with friends and family. It has also really opened up this most beautiful part our country to the tourism market that is so important for our country. Businesses are thriving, communities are being strengthened and opportunities are being opened up for people young and old. Danny Cusick, Chair of the Borders Railway Blueprint Leaders Group and Director of Tourism at Scottish Enterprise, said: “We’ve always been confident that the Borders Railway project would deliver real economic opportunities for the area, and the numbers highlight that not only has this proven to be a boost for the local economy, but it is fast becoming one of Scotland’s most loved tourist attractions. A new report published today has found that the Borders Railway is attracting new workers, homeowners and tourists to communities served by the line.